"Somewhere a trumpet razzes a long note. The Storyville Stompers Brass Band has arrived. 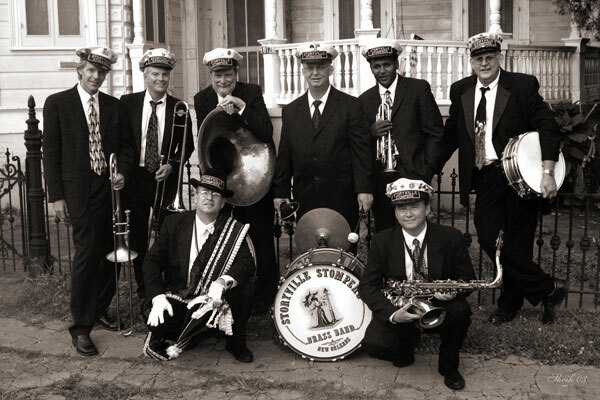 They sound exactly the way a New Orleans jazz band should"
Twice Winner of "Best Traditional Brass Band"
The Storyville Stompers Brass Band, established in 1981, plays New Orleans music in the traditional style, a music considered the foundation for Jazz and Dixieland. The Storyville Stompers perform regularly in and around New Orleans at weddings, second line parades, conventions, festivals, concerts, airport greetings, receptions, parties, and any other function that warrants celebration. The band also performs at jazz funerals. The Storyville Stompers have been enjoyed by audiences of all ages in Asia, Europe, South America, across the U.S., and at sea. The Stompers also perform regularly at the New Orleans Jazz and Heritage Festival, the French Quarter Festival and recently on the Regis and Kelly Show as the House Band. Are you human? What is 7-3? Listen to our music below and contact us for more info about scheduling a performance.